We hold more than 2,200 mineral leases in Canada, mainly in Alberta and British Columbia. We produce and market natural gas, natural gas liquids (NGLs), synthetic crude oil and bitumen. 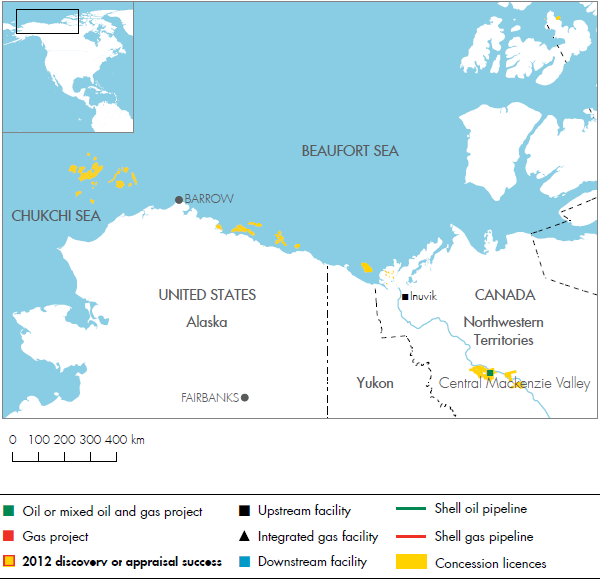 In addition, we hold significant exploration acreage offshore. Bitumen is a very heavy crude oil produced through conventional methods as well as through enhanced oil-recovery methods. Synthetic crude oil is produced by mining bitumen-saturated sands, extracting the bitumen from the sands, and transporting it to a processing facility where hydrogen is added to produce a wide range of feedstocks for refineries. 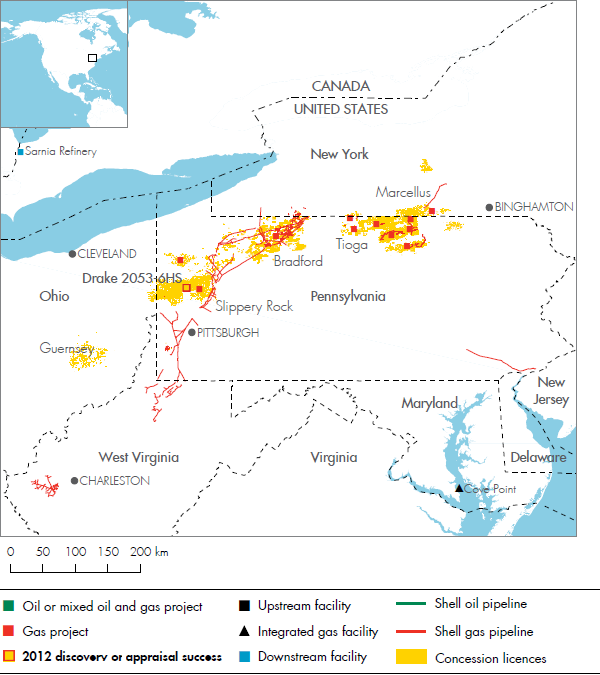 We hold rights to more than 10,000 square kilometres of conventional gas, tight gas and liquids-rich shale acreage. We own and operate four natural gas processing and sulphur-extraction plants in southern and south-central Alberta. 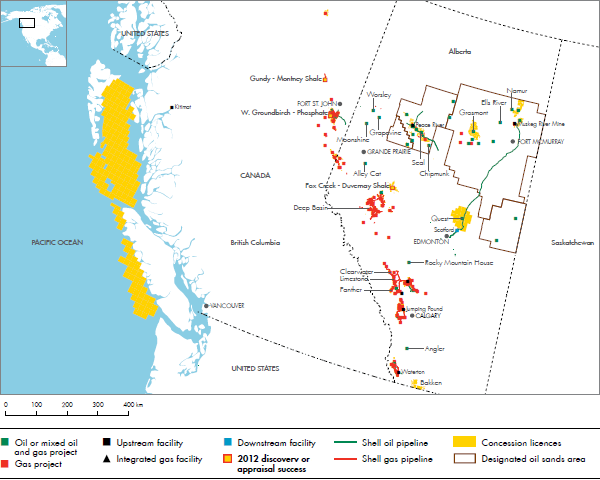 During 2012, we continued to develop conventional gas, tight gas and liquids-rich shale fields in west-central Alberta and east-central British Columbia, through drilling programmes and investment in infrastructure facilitating new production. We operate the Athabasca Oil Sands Project (AOSP) in north-east Alberta as part of a joint venture (Shell interest 60%). The AOSP’s bitumen production capacity is 255 thousand boe/d. The bitumen is transported by pipeline for processing at the Scotford Upgrader, which is operated by Shell and located in the Edmonton area, Alberta. The first phase of the AOSP Debottlenecking project comes online in 2013, and is expected to add an additional 10 thousand boe/d at peak production. We also took the final investment decision on the Quest Carbon Capture and Storage project (Shell interest 60%), which is expected to capture and permanently store more than 1 mtpa of CO2 from the Scotford Upgrader underground. Shell also holds a number of other minable oil sands leases in the Athabasca region with expiry dates ranging from 2018 to 2025. By completing a certain minimum level of development prior to their expiry, leases may be extended. We produce and market bitumen in the Peace River area of Alberta, and have a steam-assisted gravity drainage project in operation near Cold Lake, Alberta. 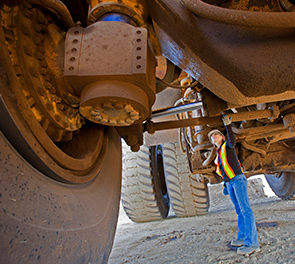 Additional heavy oil resources and advanced recovery technologies are under evaluation on approximately 1,200 square kilometres in the Grosmont oil sands area, also in northern Alberta. 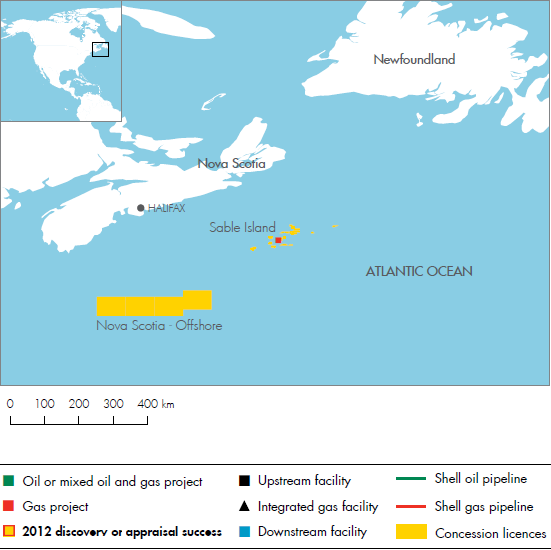 We have a 31.3% interest in the Sable Offshore Energy project, a natural-gas complex offshore eastern Canada. We also have a 100% operating interest in frontier deep-water acreage offshore Nova Scotia, a 20% non-operating interest in an exploration asset off the east coast of Newfoundland, and a number of exploration licences in the Mackenzie Delta in the Northwest Territories.